As the power outages and utility rates increase, it becomes necessary for businesses and homeowners to have a backup system to meet these emergencies. Currently, many who need backup opt for a generator to meet their needs created by the unexpected power outages. But a generator introduces many expenses and undesirable environment. With generator backup, many suffer badly from the noise and smelly gases exhausted by the generators. Exhausted gases are not only smelly but also harmful to the environment and create health hazards. Generators also need to be operated monthly basis even when there is no power outage to ensure their proper operation and serviced by a generator company approved service person to maintain the generator warranty. With the reduction in solar and storage prices solar battery storage energy systems are becoming popular as backup power systems for providing electricity for many applications. With solar battery backup system, the excess energy generated by solar during daylight hours can either be stored in the batteries for later use or sold back to the grid. Both the grid and the solar array can charge the battery of a solar battery power system. A generator backup is used only when there is a power outage, in contrast, a solar battery backup power system is used on a daily basis for smart energy management. Solar battery power system allows the user to choose how much solar generation goes into the battery and how much goes back to the grid as well as at what time it is sold back. The utility rates are different depending on the time of day which means that energy can be bought from the grid during low-cost hours stored in the battery and used during high-cost hours. Unlike generators, solar battery power system does all these without making any noise or releasing any harmful gases. Many of our customers are thrilled with how well the system performs and how quite their house compare to running a generator. If you are wondering how much a solar installation would cost to offset the electricity bill, and have peace of mind with a solar battery power system complete the Free solar Assessment request at our website e or give us a call at 416-855-9377. We are one of the top solar energy companies providing solutions that are second to none. We provide solar plus storage hybrid energy solutions across Ontario including Toronto, Markham, Mississauga, Burlington, Oakville, Brampton, Vaughan, Ajax, Pickering, Whitby, Oshawa, Caledon, Stouffville, Richmond Hill, Newmarket, Aurora, Milton, Georgetown, and the Greater Toronto Area (GTA). A hybrid energy system usually consists of two or more energy sources used together to provide increased system efficiency as well as greater availability of energy supply. The intensity of solar radiation and wind can change randomly, and electricity generated from these resources will also change randomly without any notice. With the increased amount of power generation from solar and wind, energy storage is becoming increasingly important for reasons including the availability of power, grid stability, energy management as well as demand reduction. There are many different energy storage technologies – mechanical, pumped storage, thermal – molten salt, and chemical-batteries. Each type of storage has unique characteristics that differentiate them from others, as well as the types of power sources with which they can be integrated. Chemical storage systems are generally battery-based systems that use chemical reactions to store and convert energy. Battery-based storage systems had been widely in use in many small to midsize day to day applications. Now Lithium ion batteries based storage systems have become the choice for large scale day to day applications. With regularly rising and tiered utility rates more and more people are choosing to invest in hybrid solar energy systems which provide them with both stable power and energy savings. In areas where the utility grids are not stable, hybrid solar energy systems are the ideal solution currently on the market. Acting as a backup when the grid is down, and allowing owners to send excess power back to the grid when there is excess energy. With a solar hybrid system with battery backup, the excess energy generated during daylight hours can either stored in the batteries for later use or send back to the grid. Hybrid inverters have smart electronics on board that allow the user to choose how much solar generation goes into the battery and how much goes back to the grid as well as at what times. Smart hybrid inverters also enable the customers to buy from the grid during low-cost hours and send back to the grid during high-cost hours. Solar alone cannot do this; the battery in the hybrid system is what makes this possible to do all these. In the case of the hybrid solar PV system, both the grid and the solar array can charge the battery. The hybrid inverter allows the user to choose how much of either one will flow into the battery. Some hybrid inverter systems can connect to 3 different power sources, the grid, the solar array, and a generator. They are each controlled by the hybrid inverter and are utilized based on the user’s settings during commissioning. We are one of the top solar energy companies providing solutions that are second to none. We provide solar plus storage hybrid energy solutions across Ontario including Toronto, Markham, Mississauga, Burlington, Oakville, Brampton, Vaughan, Ajax, Pickering, Whitby, Oshawa, Caledon, Stouffville, Richmond Hill, Newmarket, Aurora, Milton, Georgetown, and the Greater Toronto Area (GTA). People looking for solar options often puzzled with terms kilowatt and kilowatt-hours. Electricity used is measured by kilowatt hour and the solar power systems are sized in kilowatts. This is where questions often come about kilowatts and kilowatt-hours. 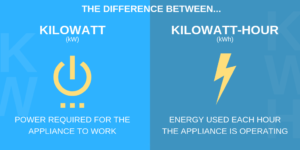 So what exactly does a kWh mean and how does it differ from a kilowatt (kW)? A kilowatt is a measure of how much power (capacity) a device can provide; kilowatt-hours define the amount of work performed in one hour of time or amount of energy used to do that work. A 1.5 kilowatt (1500 W capacity) kettle will boil the same amount of water faster than a 1 kilowatt (1000 watt capacity) kettle. Regardless of the power of the kettles, energy needed to boil the same amount of water is the same. In this case, energy is provided by electricity and the amount of electricity used by both kettles to boil the water is the same. Say 1.5 kilowatt (1.5KW) kettle took 0.5 hours (30 minutes) to boil the water, electricity used = 1.5 X 0.5 = 0.75 kwhr; unit of measure for electricity (energy) is kwhr. We know smaller kettle takes longer to boil the water; how long? We know electricity (energy) used by both kettles are the same; 1 X T = 0.75, T = 0.75 hours (45 minutes), 1-kilowatt kettle will take 45 minutes to boil the same amount of water. The Net Metering program allows offsetting the electricity purchased from the utility company with solar electricity during twelve consecutive months. To do this as solar energy solutions providers we need to size the solar power system that is able to produce the amount of electricity a customer use in twelve consecutive months. Electricity bill report usage in kwhr, and when evaluating solar installation to offset this electricity we talk about the size of the solar power system needed in kW. In the earlier example, we talked about how a 1,000-watt kettle will use 1 kilowatt-hour in one hour of use. When talking about solar, the process of converting power capacity (watts) into expected energy output (kWh) is not as simple due to a number of factors. One thing is certain: a kettle will consume power at a constant rate regardless of whether or not you live in Toronto or California, if it’s raining or if it’s placed on a certain type of countertop. Whereas solar panels output is greatly affected by the environment and circumstances it is installed. Factors such as the angle and orientation of the roof and the amount of sunlight hours in the town solar panels are located will significantly impact how much electricity it will produce. So, for example, a solar panel on the north side of a roof will produce than the same panel on the south side of the roof because south facing roofs typically receive higher sunlight exposure. Those wondering how much a solar installation would cost to offset the electricity bill, complete the Free solar Assessment request at our website e or give us a call at 416-855-9377. We are one of the top solar energy companies providing solutions that are second to none. We provide energy solutions across Toronto, Markham, Mississauga, Burlington, Oakville, Brampton, Vaughan, Ajax, Pickering, Whitby, Oshawa, Caledon, Stouffville, Richmond Hill, Newmarket, Aurora, Milton, Georgetown, and the Greater Toronto Area (GTA). Is Your Solar Panel Installation Battery Storage Ready? Lithium-ion battery cost has fallen since 2010 and it highly benefits the electric vehicle and renewable energy storage markets. Although Lithium-ion battery costs have fallen considerably, they are still not affordable for many home and business owners. Even if lithium-ion solar battery cost doesn’t fit in your current budget, planning for a solar system with energy storage will be a good idea for the future and save your money in the long run. Grid-tied systems are required to shut down during blackouts, even when the sun is shining. This is a regulated safety design feature of grid-tied solar energy systems intended to prevent workers from getting electrocuted while performing repair work on power lines. Unless solar PV system has battery storage, solar system owners cannot use the solar power from the grid-tied solar PV system during power outages. Installing batteries also enables the use of solar energy when the sun isn’t shining-night and cloudy days. Some utilities also charge higher rates during peak hours and for peak power consumption. Installing batteries allow customers to use stored solar energy instead of more costly grid power during peak hours and reduce peak power consumption. This option is becoming very popular in Hawaii and California, where cost of electricity associated with peak hours is very high. If you are in the process of installing a solar panel system and want the option of battery storage in the future, it will be helpful to plan accordingly. If the solar system is designed considering storage option in mind, it will be relatively easy to add the batteries to the system in the future. It is more difficult and more costly to add battery storage in the future if the solar system is not battery ready. Choosing a solar system with an inverter that has battery storage capabilities is one way to prepare for adding batteries in the future. This would enable the solar system to operate only as a grid-tied solar panel system until batteries are added. Therefore, it will be beneficial to consult a reputable solar PV system designer to avoid unnecessary expenses in the future. New Dawn Energy Solutions will work with you to design your storage ready solar PV system. Thinking to install solar now and add storage later? Contact us for a free consultation at info@newdawn-es.com or 416-855-9377.